You can't have failed to have seen the new John Lewis promotional advert that has been inundating TV screens on all commercial channels for a couple of weeks now. 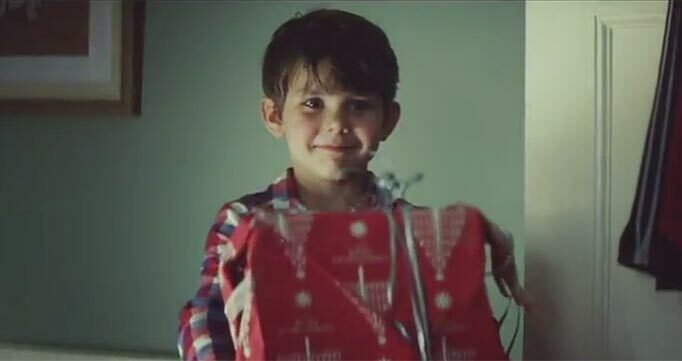 It's a very clever advert that tells the story of a little boy anxiously waiting for Christmas morning. Having all been children, we can immediately connect with the advert because we empathise with that gnawing sensation of our stomach tying itself in knots as the days agonisingly edge towards Christmas. It's a feeling we can all associate with. The backing track of Slow Moving Millie's cover of The Smith's "Please, Please, Please, Let Me Get What I Want." harnesses the emotional connection and ratchets it up wonderfully. However, there's a wonderful twist in the tale. When Christmas morning finally arrives, we discover the boy was not anxious about the presents he was going to receive from his parents... but instead he was desperate to give a gift that he has crudely wrapped up for his parents to receive. Some Morrissey and Smiths fans have shown a lot of contempt for the fact that John Lewis chose to use a cover version instead of the original. They've also attacked Amelia Warner (Slow Moving Millie), for being one of the commercial cash cows that are engineered by the likes of Simon Cowell and ripping off a classic. I completely and utterly disagree with them. The melancholic nature of the original track makes the song extremely downbeat. It's a lamentation and almost resignation that life doesn't seem to ever go the way the songwriter wants. The cover seems to transform the sentiment and carry with it the hope that luck, consequence and fate will change and the wheel will turn. If you think about it in context, the advert actually needs this sentiment in order to work properly. For those who contend with Ms Warner herself, I would point out that she is an established songwriter herself and I would contend that having written songs that convey her own feelings, she has earned the right to channel someone else's. Oh and apparently Morrissey himself said he liked it. The time of year being what it is, the advert got me thinking about the nature of expectation and giving and the way we perceive God. As Christians, we live or lives in the context of eternity... and our hopes and expectations are set on heaven... Advent reminds us of this very fact. Even though this is the case, we also live temporal lives... our "earthly tents" and we naturally have hopes, desires, aspirations and expectations for the time we spend here too. If we aren't too careful there is a real danger that we become like children waiting for Christmas. We sit counting the hours, peeling away the doors on the advent calendar of lives and looking at the pictures... and we miss the moments. While we wait expectantly and hopefully on God's promises... shouldn't we be more proactive and beneficial? 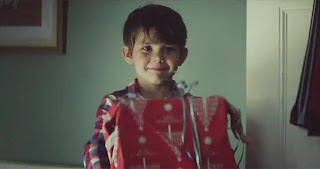 Maybe we can learn a lesson and be like the kid in that John Lewis advert. Perhaps it is time for us to start trusting in God's promises... accepting that they will be fulfilled in the time he has deemed right in his wisdom. Having accepted this, perhaps we can instead turn our attention and contemplation to how we can serve him. We need to move the big red presents from the back of our wardrobe and bring it to God. While we wait on his goodness we can be sharing that same goodness to enrich the lives of others in a godly way. Inasmuch as we are expectant beneficiaries of God's blessings, we are also agents of such blessings... and we have a roll to play in distributing God's gifts & fruit to the people we meet in the world everyday around us. For it is indeed more blessed to give than to receive. But it also works the other way too... doesn't it? While we live in these shadowlands, following in the footsteps of an omnipotent God, it's easy to fall to the temptation that everything we do is solely for his benefit... particularly when times are tough. We would certainly not be the first of God's people to question his motives - the Bible has plenty of examples from prophets to kings to apostles. I think we have to take a look at ourselves an honestly ask the question: Is there a bitter seed of distrust in me that believes God is taking advantage of me? Is there a part of us that considers God to be a kid pouting in the corner selfishly waiting for what he will get from us, without consideration of our mortal needs and desires? "Which of you fathers, if your son asks for a fish, will give him a snake instead? Or if he asks for an egg, will give him a scorpion? If you then, though you are evil, know how to give good gifts to your children, how much more will your Father in heaven give the Holy Spirit to those who ask him!" If you do think that, then you are either in for an awful shock or a wonderful surprise on "Christmas Day". You see, I believe God is just like that kid in the advert too! While we may regard him with petty suspicion... he's sat there, not pouting about what he's waiting for from us... he's agonising over the wait to give us his good things. There are times when the time, the person or the circumstances are not right... and God has to patiently wait while he refines us or grows us or makes the necessary changes for him to be able to pour out his blessings. And if we had any doubt at all about God's ability to give selflessly, then we need look no further than December 25th. At this time of year Christians across the planet recall with special affection the day that God became incarnate as man and gave himself completely and utterly to the cause of totally redeeming us. I want to leave you with one more thought. There's another advert... a Channel 4 spoof commercial featuring Gordon Ramsay (promoting his Christmas cooking programme). It pretty much matches the John Lewis advert with one exception... as the little boy heads through the house to give his parents his lovingly wrapped gift, he opens the kitchen door to be greeted by Gordon Ramsay who aggressively sharpens some knives and curtly tells him to get peeling the spuds. Let's not be like that. If God has something really precious to give us... lets not lose sight of that. Let us not become so obsessed with our small potato spiritual shopping lists that we miss the really big things that God has for us.